This illustrates both the best and worst of running one's own company. 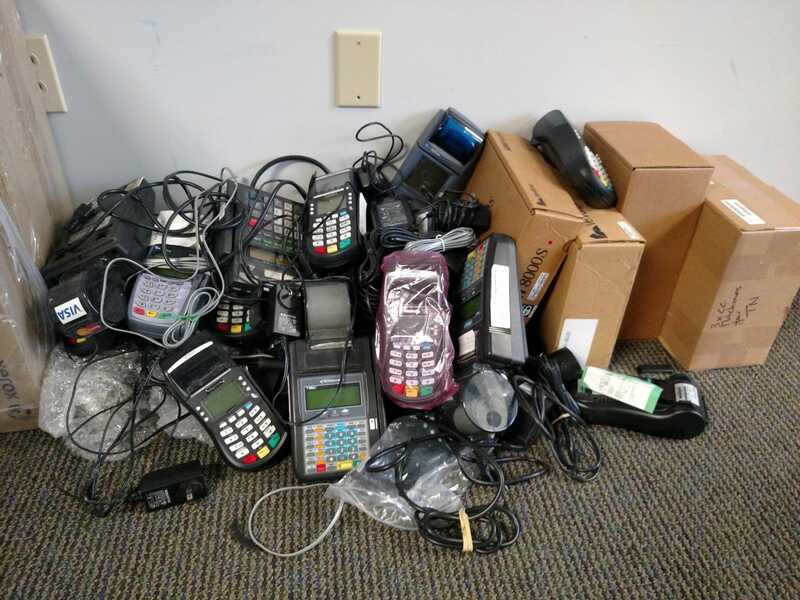 The bad: As CEO, I am actually futzing with distributing credit card terminals to the field and collecting the used ones to be recycled. Merchant guy: Do you want to pay an extra $100 for the terminals to accept NFC payments (e.g. Apply pay, Android pay). Me: Um, sure seems like the future. Does it cost more to clear a transaction that way? Me: They yes, I'll take it. Now, we can take smart phone payments at dozens of public parks my company operates, all decided and implemented in about 30 days. By the way, I am amazed at how many large companies like CVS appear to have the chip card readers but the store clerk tells me that they are not turned on yet whenever I try to stick my card in that slot (for those of you who don't know, the chip side goes head into a slot like an ATM slot on the front). October 1 was the date that there was a liability shift, where merchants bear more liability for fraud if they don't take the chipcards. Not sure how I was able to get this done in my little company but they can't manage it. I was told by one person at CVS, a store manager but they may be off base, that they don't take the chip cards yet because they take longer than swiping. This seems dumb. First, many retailers for swipe cards waste time asking for the last four digits of your card, which is not necessary with the chip cards. Further, CVS wastes a TON of time at the register with their stupid loyalty program. Yes, I know it is a pet peeve of mine I rant on from time to time, but I have spent a lot of time waiting for people in front of me to try different phone numbers to see which one their account is under, or to waste time signing up for a loyalty card with 6 people in line behind them. Makes me crazy. If they can waste 30 seconds each transaction on stupid loyalty cards they can wait three extra seconds for a more secure credit card transaction. PS2: Never, ever lease a credit card machine. You pay about 4x its retail price, even present value. I got roped into doing this for a few machines on the logic that this equipment transition was coming, and they would switch out my equipment. But then they sold their leasing portfolio and the new owner wouldn't honor this promise, so I ended up overpaying for the old terminal (and having to pay $1000 each just to get out of the lease) and then buying the new terminals. Live and learn. I have noticed recently that the TSA has created split lines at many airport security screening posts - one for experienced travelers and one for "casual" travelers - i.e. noobs. I have no problem with the basic idea. Long ago I began advocating special lines for public electronic devices (airport boarding pass machines, supermarket self-checkout, ATM's) for people with IQ's over 90 because I always seemed to get behind the person who had never even seen a keyboard in their life. But the actual execution of this concept in airports is laughable. In the last 4 airports I have been in, the split between passengers who know what they are doing and those who don't is only through the screener who checks ID. Even the lamest travel noobs are generally able to cough up an ID and boarding pass without too much trouble (though I will say I always seem to get behind the guy traveling on some bizarre 1930's-era League of Nations passport that seems to take forever to process). However, after this ID screening the two lines come back together and everyone is mixed again. Just in time to hit the x-ray screening station, where inexperienced travelers can hold up the line for hours. Students Make $100 Financial Mistake: Very Alarming! This story comes from the Arizona Republic as part of the general effort to maintain the ban on payday loan companies passed earlier this year (their is a proposition on the ballot in November to overturn the ban). At least 5 percent of last year's freshmen at the University of Arizona obtained a payday loan, a figure the surveyor described as "very alarming." about a third of the class - who enrolled in fall 2007. "As consumers, students shouldn't be using payday loans as a resort to deal with financial stress," Shim said. I wouldn't really recommend that students use this expensive form of ready cash, but I can't say I am particularly alarmed. How can any of us know what pressures they are under. In most circumstances, paying a 30% interest rate seems too high. But I know, from personal experience, there are times when short term liquidity is so valuable you might pay anything for it (just look - the American taxpayers are paying about a trillion dollars this year just for short-term liquidity). In fact, if students have a bad experience, it's probably better to learn a $100 life lesson in college rather than a $500,000 life lesson later flipping condos on interest-only loans. I personally had my own caveat emptor eye-opener with Columbia House Records in college. Nothing like getting stuck with a couple of over-priced America albums to teach financial horse sense. Muskrat Love... aaaarrrggghhh! Anyway, the effort to ban payday loans altogether is one of those elitist, snobby, holier-than-thou, we're smarter than you unwashed masses issues. Middle class homeowners who are upside down in their mortgages are not calling for inexpensive mortgages to be banned, they just want a government bailout. The government may spend a trillion dollars in the end supporting the mortgage market. But if poor people pay a high fee for a $100 loan, we have to ban the whole industry. The fact is that there is always a demand for ready cash at high interest rates, and if you drive it under ground, people just go to Tony Soprano instead. Oh, but you are not for banning payday loans, you just think the interest rates are too high, and that what is needed is government regulation of the rates? Uh, OK, I'm sure that will go well. Past government efforts to reduce the interest rate premium for risk have worked out really well *cough* mortgages *cough*. effectively paying 195% to get liquid with your own money. For this kind of vig, at least payday loan customers are getting the use of someone else's money. Restricting Credit to the Unsophisticated -- And Are You Really Any Better? After years of arguing that expanded credit is critical for the poor, and attacking banks for "red-lining" poor and minority districts, the liberal-left of this country has reversed directions, and has decided that the poor can't handle credit. No matter how much folks want to paint the recent mortgage problem as some sort of fraud perptrated on homeowners, the fact of the matter is that in large part, lenders lowered their income standards and a lot of those folks now can't pay. While we have yet to see any specific legislation beyond bailouts, it is impossible for me to imagine any reaction-regulation that does not have the consequence (intended or not) of restricting credit to the poor. appears they will have to find something else to offer besides payday loans. pleas from lenders that their stores would close and 6,000 employees would be put out of work. to pay for old ones. So it did what the House did last month: dropped the hammer. and said we're done with this toxic product." And perhaps soon in Arizona. Yes, the interest rates are astonishing, though the dollars involved are seldom huge for the short life and small size of the loan. And, as an extra added bonus, Tony Soprano does not send someone to break your legs if you don't pay (the Sopranos being the only alternative provider once payday loan companies are illegal). So, for those of you oppose payday loans, you are welcome to comment below about what a bad idea they are. However, I challenge folks to criticize payday loans without simultaneously implicitly expressing disdain for the intelligence of payday loan customers, or trumpeting your ability to make better decisions for payday loan customers than they can make for themselves. However, for those who think they are ever so much smarter than payday loan customers, who are charged a lot of money for small liquidity boosts, consider this: Let's say you take out $40 each week from an ATM to keep you liquid and that the ATM fee is $1.50. You are therefore spending $1.50 or 3.75% for a one week liquidity boost of $40, which you must again refresh next week. Annualized, you are effectively paying 195% to get liquid with your own money. For this kind of vig, at least payday loan customers are getting the use of someone else's money. So we're going to build a wall and send an army to the border. Maintaining a military to defend a group of people against outsiders who wish to use force against them is one of the core functions of government. Even crazed libertarian anarcho-capitalists like myself concede it as a function of government. If libertarians were to have their version of the ten commandments, the only phrase that would have to be on the stone is "Thou shalt not deal with thy neighbor through force or fraud." The government maintains police and a military to handle the people who wish to violate this one commandment. Throughout the years, countries have built armies and fortifications to defend against invaders who wanted to loot their lands, or steal their property, or impose their own version of racial or religious uniformity. The US Army itself has fought for freedom, it has fought to restore democracy and individual rights, it has fought to stop genocides. Today, the US Army sallies forth again, to fight for and defend .... what? It fights to stop waves of Mexican immigrants that are dangerous because they ... want to freely exchange their labor with US Citizens? It fights to protect Americans from ... competition for unskilled labor jobs? It valiantly rides forth to make sure Americans never face the horror of ... interacting with someone with only broken English? The soldiers racing to the borders are not fighting for me, because I am not in danger. And neither is anyone around me here in Arizona -- no one from outside the border is threatening me with force or fraud (surprisingly frequent emailers sending me messages about Mexicans all being diseased criminals notwithstanding). Its not like I live blithely ignorant of the border area in Kansas. I life in Phoenix, and run businesses right down on the border. I don't feel a threat or danger. In fact, the only danger I see is that the army may come down and drag families who are my friends out of their homes and out of the country (or into concentration camps, as one conservative writer longed for). Update: Nick Gillespie comments on the fact that Congress has given its official sanction to my speaking English. States is the influx of Spanish speakers from across the border with Mexico. As I have written before, I have gotten more bizzaro emails on my pro-immigration stand than anything else I have written about. Gillespie apparently has had the same experience. fraud lawsuit, reports the Chicago Tribune. Spitzer fined 15 operators $10,000 for pumping up their prices. understanding of why U.S. interchange rates are so high. Right. Then why are we dragging these people in front of Congress, except that you want to use the coercive power of government to change their business practices? If you have Ralph Nader's PIRG behind you, then you are looking to weild the government's hammer to achieve something you couldn't achieve through free, voluntary association and negotiation. As a retailer, credit card companies piss me off too, but I don't run to Uncle Sam for relief. I just don't accept certain types of cards, like ATM cards with PIN verification, since they cost a fortune in fees. And in a lot of locations, I don't accept cards at all. We have put ATM's onsite in a lot of places, reasoning that if consumers want debit card convinience, they can pay the fees by using the ATM machine and then paying us in cash. ATM Cards More Expensive to Process than Credit? Does this make any sense: It costs us a lot more, for small transactions, to process an ATM / debit card with the pin pad than a credit card. Bank of America charges a flat 60 cents per ATM card / PIN pad transaction in our stores but charges 10 cents plus 2% on credit cards. So, on a typical $5 convenience store purchase, BofA charges $0.60 or 12% to process a ATM / debit card but $0.20 or 4% for the credit card. I understand the difference between value- and cost-based pricing, but in an economy of scale transaction processing business with a lot of competitors, I would think debit would be cheaper to process, even without the credit risk issues. Customers give me feedback that I am a neanderthal for not accepting ATM cards with a pin pad at the registers. This is the reason. Its cheaper for me to provide an ATM and then have them pay cash - that way they pay the fee, not me. Also, their fee is lower. Even if they only take out $20 and pay a $1.50 fee, they are still only paying 7.5% vs. the 12% typical I would be paying. If anyone knows a company that offers a better deal, the comment section is wide open! Update: A couple of notes based on the comments. First, I do indeed understand that prices are not cost-based. The notion that pricing should be cost-based is one of the worst economic misconceptions held by the average person (behind the commerce is zero-sum myth). When prices don't make sense to me, I don't run to the government asking for Senate hearings so corporations can "justify" their pricing, I just don't buy from them. Second, to another commenter's point, most card processing agreements and some state laws prevent merchants from passing card processing fees onto consumers in a discriminatory way - ie they can be built into the general pricing but you can't charge one person one price and another a different price for the same item based on what kind of payment they use. So what does valet parking, soft drinks, and firewood have in common? More in a second. First, some background. We have had a problem over the last few years in our California campgrounds. We sell a lot of firewood to campers, usually in bags of 6-8 sticks. We are having difficulties getting a good, inexpensive firewood source in the Owens Valley. We can find a bunch of people who will deliver stacks of firewood by the cord for a very good price, but only one person in the valley bags the wood. As a result, the bagging step alone is effectively costing us between $1 and $2 a bundle, which is a lot for something we sell for $5-$6. In kicking the problem around, we considered what is becoming an increasingly common approach - if bagging is labor intensive and costly, lets see if we can outsource that step to our customers. Outsourcing to your customers has been around for a while, but has gotten more popular of late. Many furniture and equipment makers have been doing this for years, by outsourcing final assembly to customers. While some of this is to reduce shipping costs, part of the benefit to manufacturers is that they save on assembly labor. Service industries have started to get into the act of late. Banks have been outsourcing teller functions for years via ATM's. Most fast food restaurants have outsourced soft drink cup filling to the customers. Grocery stores (and now Home Depot) have hopped on the bandwagon, providing self-service checkout for those who don't want to wait in line. What all these examples have in common is that they seem to meet with customer acceptance if they provide some sort of value to the customer(short-circuiting lines, easier drink refills, the right amount of ice in the cup) , and not just cost-savings to the company. Which brings me to the examples that really irritate me - of companies outsourcing their payroll to me. [Note, I am a libertarian -- please do not interpret the following as a call for government action!] Tipping, in its purest form, is a way to reward exceptional (meaning - beyond the standard or expected) service. Unfortunately, restaurants and other service establishments have twisted this act of reward and generosity into having customers pay the wages of their staff. Restaurants are simultaneously increasing tipping expectations (from 15% to 20%+) while requiring tips on more and more occasions by building them automatically into the bill. The event that brought my irritation to a boil the other day actually happened valet parking my car at a restaurant. As background, the establishment charged $4 to valet park your car. Now, I am not a socialist, so I accept that value is not driven by cost but rather by what I am willing to pay for it, and I was willing to pay $4 to avoid having to walk a few blocks from the free lot (those of you from Boston or NY are wondering what the fuss is about -- a valet parking charge of any amount is virtually unprecedented in Phoenix, at least until recently). "Our employees work for tips"
What? You mean I just paid your company $4 for what amounts to about 5 minutes of labor, and now you are telling me that in addition, I need to pay your employees' wages for you too? This is pretty nervy - I mean, other than a percentage concession payment they are probably making to be the parking company at that location, what other costs do they have? I didn't want to hurt the young guy actually doing the parking, but for the first time in years I didn't tip the valet. That little sign turned, for me, an act of goodwill into a grim obligation, extorted from me by guilt. It had to offer the customer more value - a better product somehow. The plan my managers hit on was to purchase a number of small milk crates that customers could fill with wood for the same price as the old bag. These crates would hold a bit more than the old bag, so customers can get more wood for their money. In addition, customers can pick out their own pieces of wood from the stack. This is actually something that has been requested in the past - some customers complained the bags had too many small sticks, some complained they had too many large sticks. Now people can get what they want. We will try this out in a few sites to see what customer reaction is, and, perhaps more importantly, to see if we can hold on to our milk crates without them walking away. I don't know if you get these, but about twice a month we get what looks like a refund check in the mail, usually for a couple of dollars and change, from some yellow pages company. Today we got one from "Directory Billing, LLC" for $3.25. We get a lot of small checks for pay phone and ATM commissions, NSF check refunds, etc, so sometimes these almost slip through - be VERY careful. Why? Well, the check looks all normal and innocuous, but in tiny grey lettering in the background of the endorsement section on the back, there is a lot of legal verbiage that amounts to the following "by endorsing and cashing this check, you are signing up for a directory listing in some random yellow pages you never heard of for some god-awful amount of money which we will bill later".